Getting to the office is easy and there is plenty of parking. 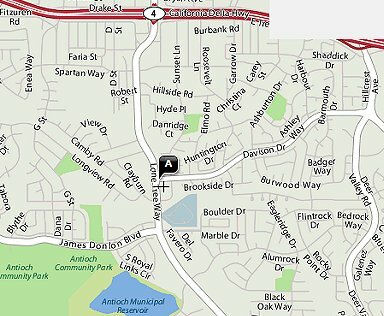 The office is located at 3701 Lone Tree Way, Antioch, Ca. 94509. The suite number is 10B. Upon parking, you will enter the building through the door closest to the Davison street entrance. There is an elevator on your left. Take the elevator to the second floor. Turn left out of the elevator and immediately right. My office is at the end of the hall on your right. From the Concord/Pittsburg area, take the Lone Tree exit from highway 4. Turn right onto Lone Tree. Turn left onto Davison and the building is on your immediate right. Turn right into the first driveway. From the Brentwood/Oakley area, you have two options, you can take the highway 4 bypass and merge onto Ca. Highway 4. Take the Lone Tree/ A street exit and turn left onto Lone Tree Way. Turn left onto Davison and the building is on your immediate right. Turn right into the first driveway. Alternatively, take Lone Tree through Antioch toward Highway 4. Turn right onto Davison and follow the directions above.